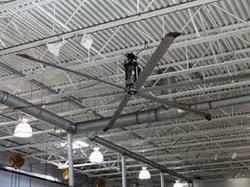 We are ranked amongst the renowned organizations that are engaged in trading, wholesaling and supplying the best quality range of Ventilation Fan. We have a exclusive range of Ventilation Exhaust Fans. Applications being the major areas of utility we design tailor made solutions with our Ventilation exhaust fans which are Latest in technology. - 600mm, 457mm, 375mm, 300mm sweap. - Total Aluminum Die Cast Body. - Sealed Double Ball Bearing. - Dynamically Balanced Steel Blades for Heavy Duty Working. Under the meticulous supervision of our skilled professionals, we are providing high-quality range of Turbo Ventilator Fan. lazer since at 30 years. Its a best company product.